Even though I am more than tall enough and most of my friends are on the shorter side, I love heels. I feel so much more put together when I wear heels so I tend to wear them almost every day at work. So when it comes time to hit the Farmer’s Market on the weekend, I’m all about the comfy flats. Moccasins are currently my favourite. Not only are they the comfiest shoes I own, but they are adorable too! Thank you for being so awesome, Minnetonka. 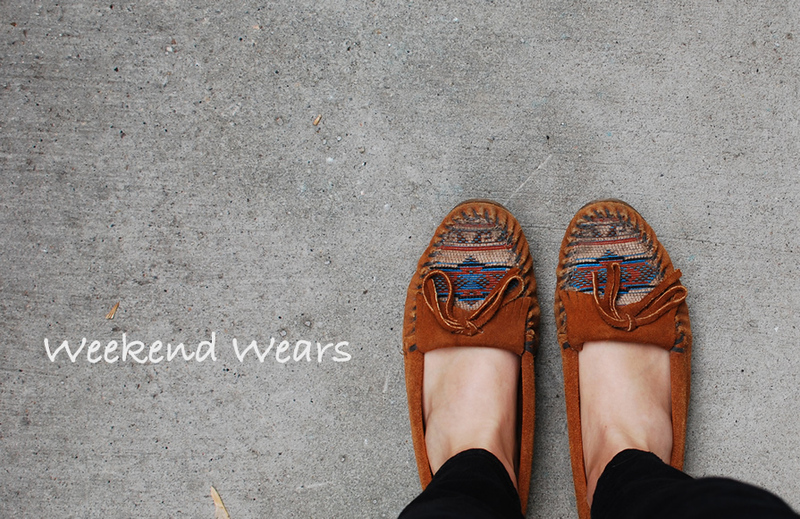 I linked to that website and now I really want another pair of moccasins. Maybe in white for summer? Life has been busy lately despite our lack of drinking and partying. Our office is undergoing renovations and I’m working on getting new manuals ready for when they are finished. It’s going to be a pretty busy couple months. I also have the opportunity to attend more events in my new role. It’s exciting to be able to put names to the faces of so many of the clients I’d spoken to on the Help Desk. N’s mom brought me back this awesome yellow coach purse from the States and I’ve been wearing it at every chance I get. I just love it. It seems totally perfect for spring and is a nice change from my usual black, brown, or blue. I’m pretty excited for the coming weekend. Cirque de Soleil’s Amaluna is in Calgary right now and N and I are going with my family on Saturday night. I’ve heard it’s incredible! We also plan to grab dinner all together before the show. Everyone knows how much I love going for dinner, so it should be a pretty great weekend!